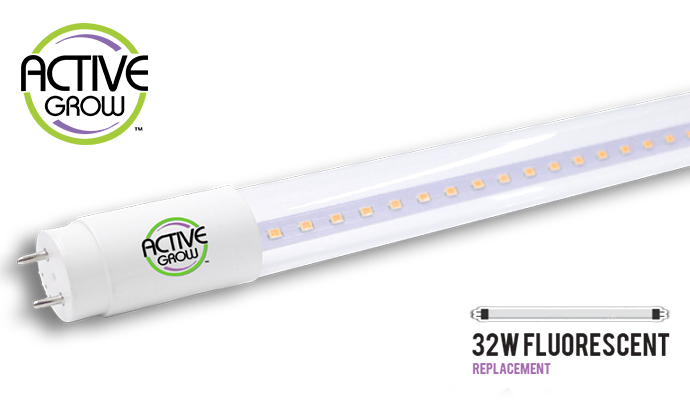 Seattle, WA, June 13, 2018, Active Grow, the sustainable horticultural lighting manufacturer is pleased to launch the T8 22W HO 4FT LED Horticultural Lamp. The Active Grow T8 HO LED lamp can turn any T8/T12 fixture into a grow light by bypassing the ballast and directing power to single-end 120-277V universal line voltage. The T8 grow light features lower energy consumption, higher PPF efficiency and formulated plant growth spectrums. The Active Grow T8 22W high output LED lamps uses 35-40% less power than T8 32W and T12 40W fluorescent lamps. By removing the existing fixtures’ ballast cultivators save even more amperage while eliminating buzzing, flickering and longevity issues. The T8 grow light features a 190° beam angle for wide light distribution and runs cool, so it can be placed closer to plants and save space. The T8 22W HO LED lamp in Sun White Spectrum has a total PPF output of 41 μmol/s making it the highest PAR output of any T8/T12 LED grow light available. The average PPFD of 2 T8 LED grow lights in a standard T8/T12 fixture exceeds T8 fluorescent lamps by more than 30% over a 2’x4’ foot area. The T8 HO LED grow light is available in two light spectrums that are 100% more effective for plant growth than traditional fluorescent lamps. The Active Grow Sun White Spectrum features a high color-rendering index (CRI) of 95 and is suitable for the entire plant life cycle. The Active Grow Red Bloom Dedicated Spectrum utilizes one diode to output dual 450 nm and 660 nm wavelengths and is ideal for propagation, root growth and flowering stages in plant growth. The Active Grow T8 LED grow light is suitable for use in commercial plant production, vertical farms, home grows for hydroponics, microgreens, tissue culture, ornamentals, vegetables, cannabis cloning, flowers, fruits and more. The T8 HO LED lamps have a 30,000-hour lifetime and are UL Classified. Active Grow T8 Horticultural Fixtures are available by request. For data sheets and more information about the T8 HO 4FT LED Horticultural Lamp click here. The T8 HO 4FT LED Horticultural Lamp is now available for shipment from our Seattle warehouse. Contact our support team here or at info@activegrowled.com and tell us about your project so we can calculate your overall savings and help get you on the path to sustainability. Active Grow team members can also help determine what utility rebates may be available in your area that can have you saving even more right away. Active Grow LLC is a commercial grade horticultural lighting manufacturer based in Seattle, Washington. The company works directly with experienced growers to develop the next-generation of horticultural lighting systems that are energy efficient and long lasting alternatives to HPS, HID and fluorescent grow lamps. Active Grow LED lights feature the latest technological innovations to help growers increase their yields and maximize their production. Follow us on Instagram, Facebook, Twitter and Youtube for the latest company updates and videos.